An important part of good customer service is ensuring that your customer needs are being met quickly and efficiently. This means not only hearing from your customers, but analyzing how your customers and your team are interacting. This is where Power BI and Zendesk come in. Zendesk allows companies to build better relationships with their customers. Power BI allows users to import data a variety of sources to quickly gain insights into their data. When connecting to Zendesk, Power BI gives users an even easier way to explore and monitor their Zendesk data with an out of box content pack. This content pack not only brings in the data, but also offers a dashboard and set of reports to get you started. 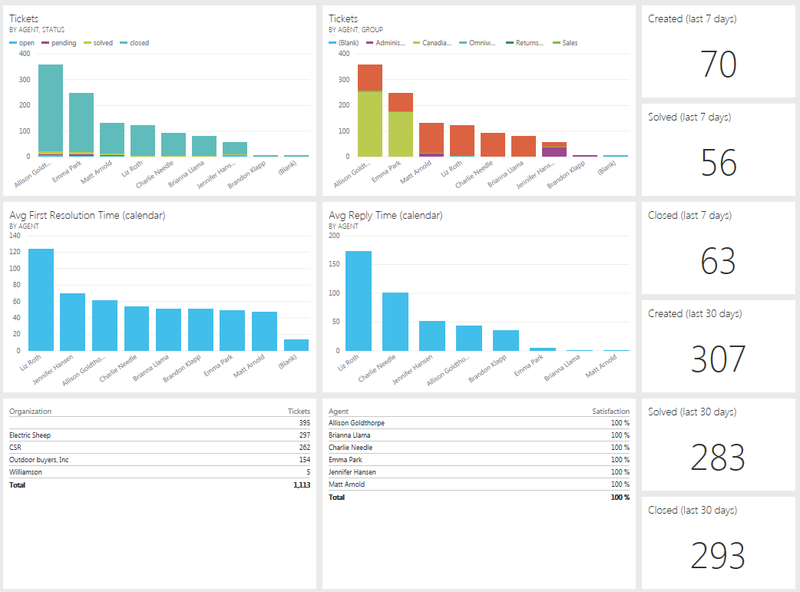 In this post we’ll cover how to get better insights to your Zendesk data using Power BI. 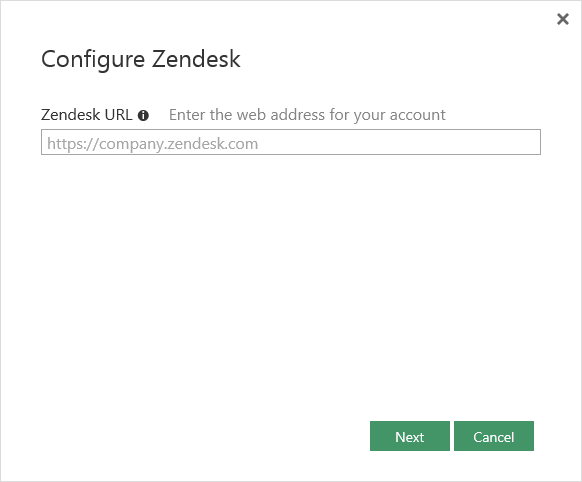 For additional details on how to connect and get started, jump to the Connecting to Zendesk section below. Power BI offers an out of box content pack that connects to Zendesk and brings in a variety of important data for you to monitor. As soon as you connect to your data, you’ll see information about your tickets, agents, organizations and more. For example, at a glance you can see the number of Tickets created, solved and closed over the last 7 and 30 days. Your dashboard can be customized however you like, ensuring you have the data that is most important to you. There are even more insights are behind each tile, in the 5 page report that comes with the dashboard. These pages include insights about Tickets, Agent Performance, Recent Activity, Activity by Agent/Group, and Ticket Activity. 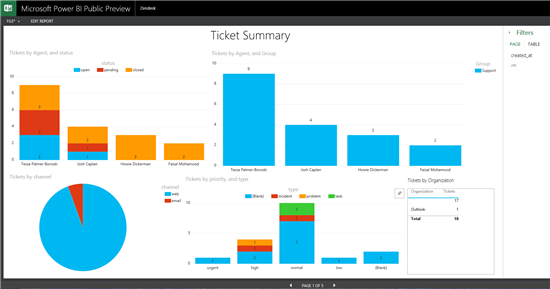 Selecting the top left tile brings you to the Ticket Summary report page – showing a breakdown of tickets by status, group, channel and more. More details about interacting with reports are available here. Selecting a visual will bring up options to change the visual type, to pin the visual or to remove it from the report. Pinning a visual will add it to your dashboard, and is a quick way to customize your dashboard with information that’s important to you. Select a value on the report to cross filter the other visuals. 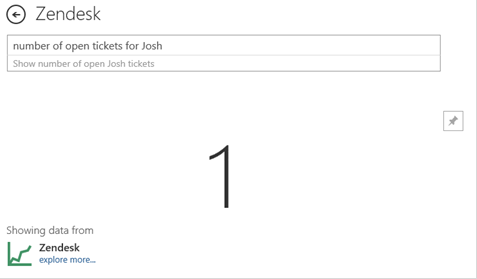 For example, selecting “open” in the top left, will filter the page to all the open tickets. You can also use the filter pane on the right hand side, to change the range of tickets you see based on when they were created. Use the navigation at the bottom to browse the other pages of the report, including Agent Performance, Recent Activity, Activity by Agent and Group, Ticket Activity. You can also chose to edit the report, which allows you to customize your reports and dashboards based on the underlying dataset. Select Edit Report in the top left corner. The view will switch to show you the field list, allowing you to access any of values and calculations included in this out of box data set – such as additional information about Users, Tickets etc. and customized calculations like Average Reply Time or Average Resolution Time. More details about editing reports can be found here. Back on the dashboard, you can also ask questions about your data using the question box. More details about Q&A can be found here. You can ask specific questions about your Zendesk data, such as “tickets by status” or one specific to your agents, such as “number of open tickets for Josh”. The results of the questions can also be pinned to your dashboard. To access Zendesk data in Power BI, you’ll need to provide your Zendesk company URL and your credentials. 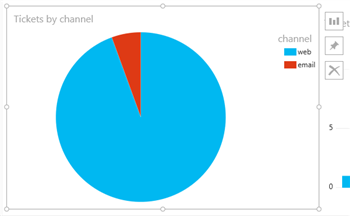 Get started by navigating to www.powerbi.com and sign in with your work account. If you don’t already have an account, it’s quick and free to sign up! Once in Power BI, you can connect to Zendesk through the Get Data link in the top right. From the list of sources you can search for and select Zendesk. The landing page describes some of the details of the connector, to continue click Connect. 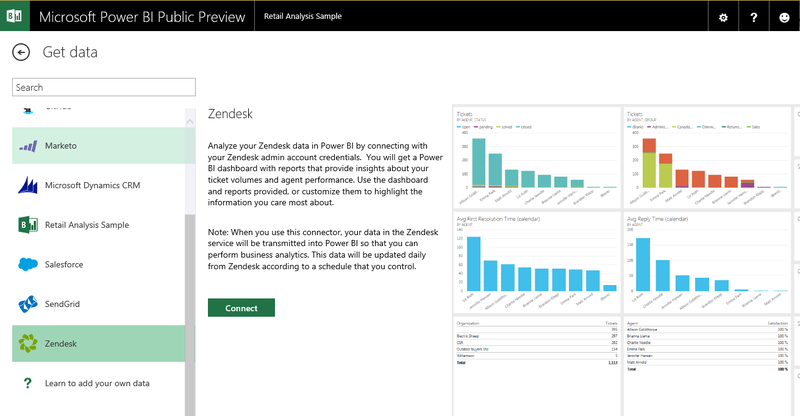 You’ve now started the import flow to view your Zendesk data in Power BI! When prompted, enter your Zendesk credentials. If you have pop-ups allowed you may automatically be prompted. If not, select oAuth 2 as the Authentication Mechanism and click Sign In. Follow the Zendesk authentication flow. Note that these credentials must be an Admin for your account. (If you are already signed in to Zendesk in your browser, you may not be prompted for credentials.) 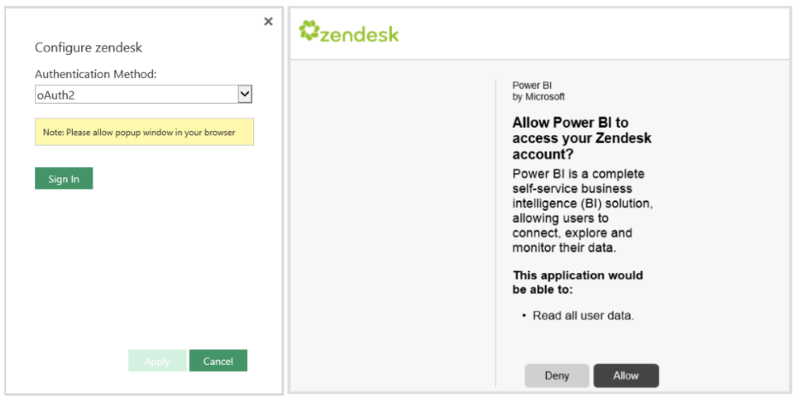 After signing in, click Allow to allow Power BI to access your Zendesk data. Click Connect to begin the import process. Once completed, a new dashboard, report and model will appear in the Navigation Pane. Your data is now in Power BI for you to monitor and explore!